I’ve just updated my C circular buffer implementation, adopting the trick originally proposed by Philip Howard and adapted to Darwin by Kurt Revis: A virtual copy of the buffer is inserted directly after the end of the buffer, so that you can write past the end of the buffer, but have your writes automatically wrapped around to the start — no need to manually implement buffer wrapping logic. This dramatically simplifies the use of a circular buffer — you can use chunks of the buffer without any need to worry about where the wrap point is. See the new implementation, which is thread-safe with one consumer and one producer, with no need for locks, making it perfect for use with high-priority Core Audio threads, on GitHub: TPCircularBuffer. There’s a basic example of its use over on the original post. iOS is by no means a realtime operating system, but I’m aware that NSTimer and NSObject’s performSelector:withObject:afterDelay: mechanism aren’t particularly accurate, and I was curious to see whether I could do better. I read in several places mention of the Mach API utility mach_wait_until (from mach/mach_time.h), which is very low-level and supposedly fairly accurate. So, based on that lead, I put together an Objective-C singleton class that launches a high-priority thread, and uses said thread to schedule events. It appears that the more stuff there is going on in other threads, the more likely the mach_absolute_time call is to overshoot. So, the more time spent in the spin lock, the more leeway mach_absolute_time has to wait too long. Of course, that’s at the cost of making the CPU twiddle its thumbs for the duration. From the iPhone 3Gs up, it’s possible to encode compressed AAC audio from PCM audio data. That means great things for apps that deal with audio sharing and transmission, as the audio can be sent in compressed form, rather than sending huge PCM audio files over the network. Apple’s produced some sample code (iPhoneExtAudioFileConvertTest), which demonstrates how it’s done, but their implementation isn’t particularly easy to use in existing projects, as it requires some wrapping to make it play nice. Here’s the result of the last few days’ work: Loopy 2 now has track importing. Drag audio files into Loopy’s documents folder in iTunes, then import into tracks. Loops are automatically time-fitted for perfect synchronisation, using the frankly awesome Dirac audio processing library. In the real world, when you hear two sounds at once, what you’re hearing is the combination (in the “+” sense) of the two noises. If you put five hundred drummers in the same room and, avoiding the obvious drummer jokes for now, told them all to play, you’d get drummer 1 + drummer 2 + … + drummer 500 (also bleeding ears). With digital audio though, the volume doesn’t go up to oh-god-please-make-them-stop – it’s limited to a small dynamic range. So, digital mixing actually requires a little thought in order to avoid overflowing these bounds and clipping. 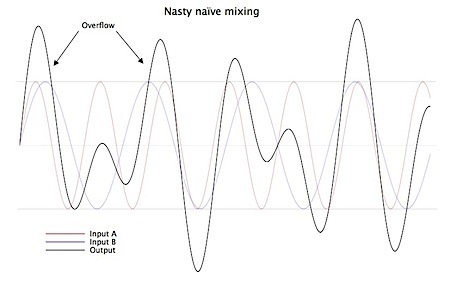 I recently came across this when writing some mixing routines for my upcoming app Loopy 2, and found a very useful discussion on mixing digital audio by software developer and author Viktor Toth. A friend made an interesting suggestion to an issue I’m facing in the upcoming Loopy 2, and I thought I’d do some investigation: How many tracks can the MultiChannelMixer (kAudioUnitSubType_MultiChannelMixer) manage at once? He was quite optimistic, and as it turns out, he was right: It’s rather capable. I modified the iPhoneMultichannelMixerTest sample project to add a bunch of channels, and measured how my iPhone 4 performed. 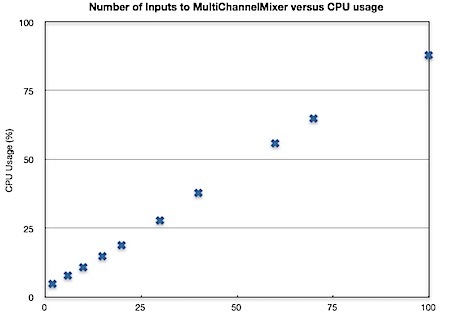 It looks pretty linear: there’s pretty much a 1:1 relationship between number of channels, and the CPU usage, actually. Of course, this is on the newest-most powerful iPhone, but there was no stuttering, and the interface (admittedly simple as it is) was fully responsive, including setting output volume, even with 100 channels. You’d probably want to stick with a maximum number of channels around the 75-100 mark, less for targeting lesser devices, but that’s a pretty generous limit. Update: Not such great news for the iPhone 3G I just tested this on, though — it freaks at anything more than 20 channels, and isn’t too responsive with 20. The 3Gs seems to behave almost as well as the iPhone 4, but the CPU:channels relationship is more like 2:1.